Tidewater Community College’s Jose Mateo and Luke Trager. Mateo and Trager won Best in Show, the top honor, at Dominion Enterprise’s information technology/web development two-day event called Hackathon, which brings Virginia college students together to gain hands-on experience in the fields of software development and design. Teams from TCC, the College of William and Mary, Virginia Commonwealth University, Norfolk State University, Christopher Newport University and ECPI University competed in the fifth annual event that allowed each team to explore creative ideas and approaches in developing new web and mobile applications. 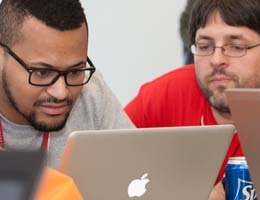 “The hackathon is a great opportunity for technology students in Virginia to get a taste of what developing is all about for a living,” said Joe Fuller, chief information officer at Dominion. Mateo and Trager, students in TCC Professor Lisa Carter’s information technology class, earned the accolade for their mobile app designed to provide information on the make, model and price from a user-entered picture of a motorcycle. The app was created for Cycletraders.com, a site similar to eBay for motorcycles. Mateo said the app would eliminate the paperwork and time it takes to decipher all the information on a motorcycle that a prospective customer might want to buy. Instead, all the details about the bike would be available simply by snapping and uploading a picture. Mateo and Trager each brought home a Samsung Galaxy tablet along with their trophy and praise from their professor.